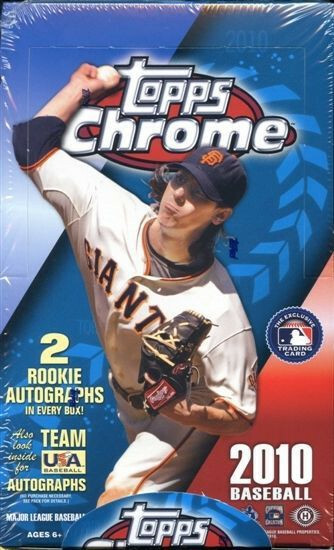 Produktinformationen "2010 Topps Chrome Baseball Hobby Box"
Look for (2) On-Card Autographed Rookie Cards per box!! Find exclusive Team USA Autograph Cards! The 2010 MLB Rookie Class is one of the best in years. Try for some of these hot Rookies: Heyward, Stanton, Santana, Castro, Strasburg, Matusz, Jackson, Davis, Nova, & many more! Key Rookies: Jason Heyward, Scott Sizemore, Mike Leake, Austin Jackson, Jon Jay, Brennan Boesch, Ike Davis, Ian Desmond, Sergio Santos, Michael Brantley. - Pinting Plates (220 subjects/880 cards) One of One! Hobby Exclusive! - Super-Fractor (220 subjects) One of One! Hobby Exclusive! - Red (220 subjects) Numbered^ to 25! Hobby Exclusive! - Gold (220 subjects) Numbered^ to 50! - Blue (220 subjects) Numbered^ to 199! AUTOGRAPH ROOKIE VARIATIONS: (25 subjects/250 total cards) 2 On-Card Autograph Rookie Cards Per Box! - Printing Plates (25 subjects) One of One! Hobby Exclusive! - Super-Fractor (25 subjects/100 cards) One of One! Hobby Exclusive! - Red (25 subjects) Numbered^ to 25! - Gold (25 subjects) Numbered^ to 50! - Blue (25 subjects) Numbered^ to 199! - Refractor (25 subjects) Numbered^ to 499! - Topps Heritage Chrome (50 subjects) Numbered^ to 1961! - Black (50 subjects) Numbered^ to 61! - Refractor (50 subjects) Numbered^ to 561! - NEW! Chicle (50 subjects) Numbered^ to 999! - NEW! Topps T-206 (50 subjects) Numbered^ to 999! - Printing Plates (100 subjects/200 cards) One of One! Hobby Exclusive! - Super-Fractor (100 subjects) One of One! Hobby Exclusive! - Red (100 subjects) Numbered^ to 25! Hobby Exclusive! - Gold (100 subjects) Numbered^ to 50! - Blue (100 subjects) Numbered^ to 199! - Refractor (100 subjects) Numbered^ to 499! NEW! MLB LOGOMAN PATCH CARDS (5 subjects) - Numbered^ to 50! Hobby Exclusive! NEW! TEAM USA AUTOGRAPHS (20 subjects) - 1 Per Case Hobby Exclusive! AUTOGRAPH INSERTION RATE - Inserted 2 Per Box! Weiterführende Links zu "2010 Topps Chrome Baseball Hobby Box"
Fanbewertungen für "2010 Topps Chrome Baseball Hobby Box"